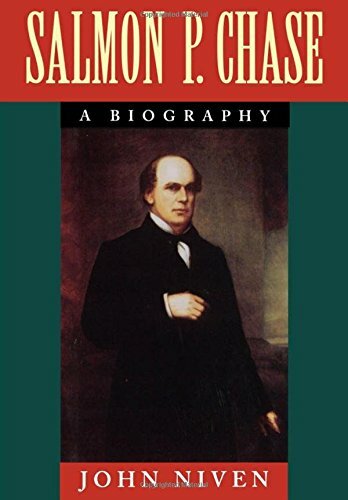 Salmon P. Chase was one of the preeminent men of 19th-century America. A majestic figure, tall and stately, Chase was a leader in the fight to end slavery, a brilliant administrator who as Lincoln's Secretary of the Treasury provided crucial funding for a vastly expensive war, the Chief Justice of the Supreme Court during the turmoil of Reconstruction, and the presiding officer of the impeachment trial of President Andrew Johnson. Yet he was also a complex figure. As John Niven reveals in this magisterial biography, Chase was a paradoxical blend of idealism and ambition. If he stood for the highest moral purposes--the freedom and equality of all mankind--these lofty ideas failed to mask a thirst for power so deeply ingrained in his character that it drove away many who shared his principles, but mistrusted his motives. Niven provides a vivid description of Chase's early years--his childhood in New Hampshire (where his father's failed business venture and early death left the family all but destitute) and in Ohio (where he was sent to live with his uncle Philander, an Episcopal bishop), his education at Dartmouth, and his early law career in Cincinnati. Niven shows how the plight of the slaves stirred this reticent young lawyer, and how Chase gradually moved to the forefront of the antislavery movement. At the same time, we see how he used his growing prominence in the antislavery movement to forward his political ambitions. Niven illuminates Chase's long tenure as a public man. Twice elected United States Senator, twice chosen governor of Ohio (then the third most populous state in the Union), Chase organized the widespread but diffuse anti-slavery movement into a workable political organization, the Free Soil party (whose slogan "Free Soil, Free Labor, Freemen" Chase coined himself). We read of Chase's work in Lincoln's war cabinet and his tenure as Chief Justice of the Supreme Court, and we also follow his many political maneuvers, his attempts to undercut rivals, and his poorly run campaigns for presidential nominations. Niven also provides an intimate portrait of Chase's family life--his loss of three wives and four of his six children, and the unfortunate marriage of his beautiful daughter Kate to a rich but dissolute man--and a vivid picture of life at mid-century. What emerges is a portrait of a tragic figure, whose high qualities of heart and mind and whose many achievements were ultimately tarnished by an often unseemly quest for power. It is a striking look at an eminent statesman as well as a revealing glimpse into political life in 19th-century America, all set against a background of the anti-slavery movement, the Civil War, and the turmoil of Reconstruction. If you have any questions about this product by John Niven, contact us by completing and submitting the form below. If you are looking for a specif part number, please include it with your message.